We’d had a day of driving and a day of hiking. It was Wednesday morning and time for us to start driving again. We loaded our car, said good-bye to our cozy cabin in Ontonagon, and started driving east, destination: Mackinac Island. Many of our driving hours were filled with conversation: Bryn asking me questions or me spontaneously sharing some personal history I thought might interest her. We covered my growing up on Mob Hill (the name my mother gave to our 9-acre homestead in Columbia, Missouri, as a counterpoint to snooty Nob Hill in San Francisco), travels across country to visit grandparents located far away in California and Oregon, boyfriends from my teenage years, and the beginnings of my relationship with Mark. Her curiosity extended beyond my memory and knowledge at some points and I had to reply that I simply didn’t know, but that one of my siblings, whom we would be reunited with on Friday, might. Here I want to insert thank-you’s to Marv B. and Vicki K. for the chicken pasta salad and pate’s that they brought to my bon voyage party. These goodies were the highlights of three days of picnic lunches, supplemented by veggies and crackers, as we drove across Wisconsin and Michigan. 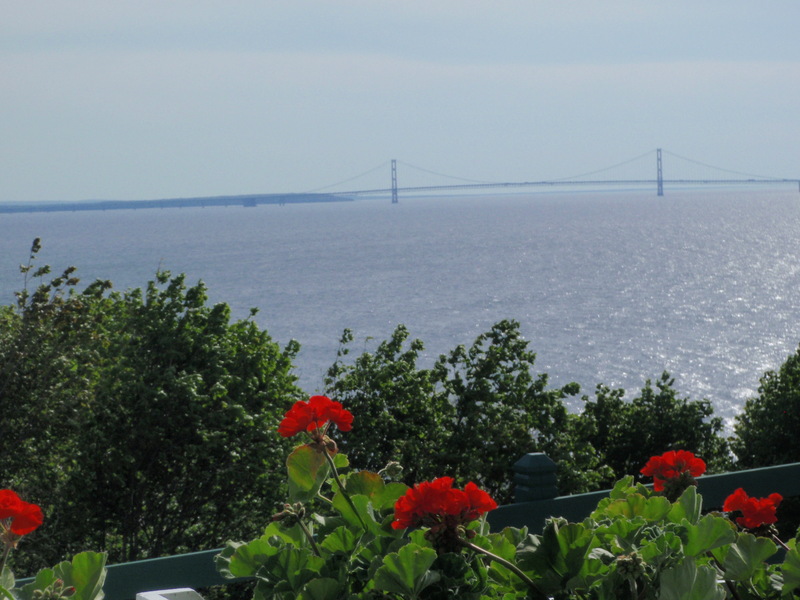 We drove over the graceful Mackinac Bridge, leaving Michigan’s Upper Peninsula, and found the ferry terminal in Mackinaw City just in time to catch the 4pm ferry to Mackinac Island. The hydrofoil sped over the waves and the Grand Hotel came into view, its magnificent facade and mustard-yellow awnings unmistakable on the horizon. Once ashore, a dock-hand loaded our luggage into a pushcart and led the way to the charming Metivier Inn, located just a block off of Main Street. While we didn’t feel we could afford a room at the Grand Hotel ($300+), we had a vision of enjoying a drink on that magnificent porch, so we called to double check about the dress code (casual attire is permitted until 6pm) and headed over. I’ll go on a tangent here for the benefit of those unacquainted with Mackinac Island. Motorized vehicles are not allowed, nor needed, on this small atoll (2 miles wide and 3 miles long). People travel principally by foot, by bicycle, or by horse-drawn carriage. Year-round inhabitants number under 500, but in the summer the population swells into the thousands when seasonal workers and tourists arrive. Mackinac Island can easily claim the most fudge shops per capita and while the downtown might be viewed as kitchy, the beauty of the rest of the island makes up for it. Bryn’s and my Mackinac visit couldn’t have been timed more perfectly. Since we arrived during the week before Memorial Day, the flood of tourists had not yet begun. The local hosts and merchants, however, were already in full gear for the heavy season ahead. 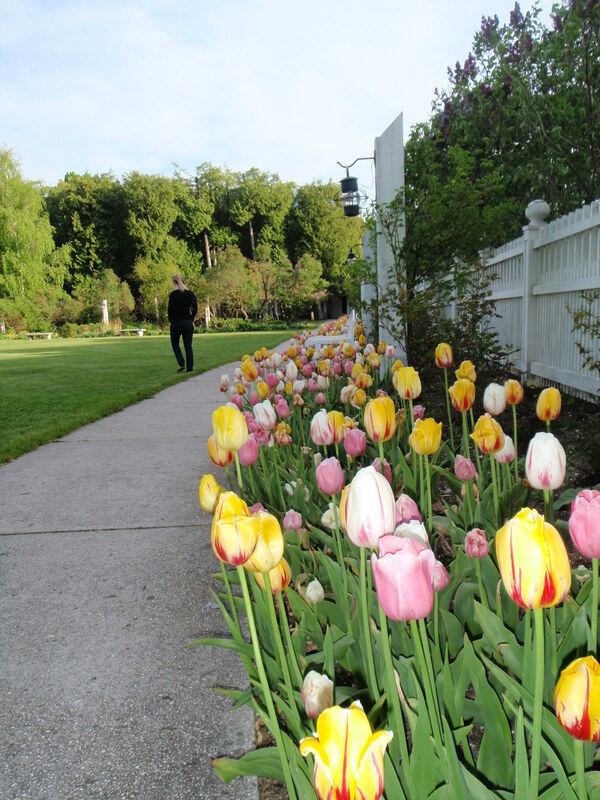 And the island was abloom — the Grand Hotel had just planted their annuals and this year’s unusually early spring meant that the lilacs and flowering trees were in their full glory. Having ascertained that we didn’t need to change clothes, Bryn and I strolled up to the Grand Hotel. On our family visit to the island years ago, Mark and I had decided that paying for the privilege of wandering around an old hotel with two young children in tow didn’t make sense, so we had instead explored the island on our bikes. This time, Bryn and I gladly paid our $10 and entered the historic landmark in search of ghosts from days gone by. We made our way to the veranda, pulled up a couple of Adirondack chairs and enjoyed the view. As six o’clock approached, the hotel staff began tidying up the porch, rearranging tables and chairs into neat groupings. We made our way inside and encountered a lobby with elegantly dressed patrons waiting to enter the main dining hall. There was also a woman dressed in period costume, feigning to be Jane Seymour’s character from the 1980 movie “Somewhere in Time” which was filmed largely at the hotel. 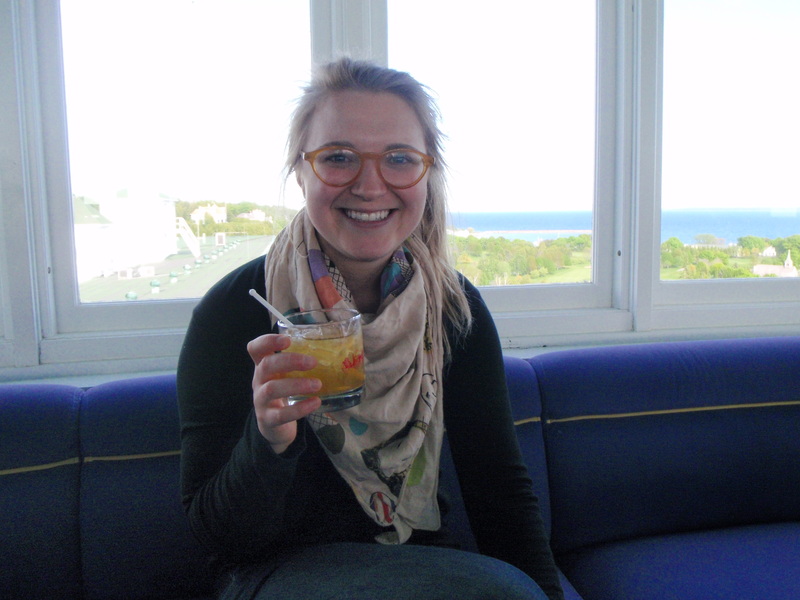 We climbed several flights of stairs up to the Cupola Bar, enjoying another fine view, along with well mixed drinks. Thursday morning we donned our running clothes and headed out for some exercise before breakfast. The ring “road” around the island is 8 miles, so we had in mind running part way around and then taking a short cut back through the interior of the island. We set out going counter-clockwise and kept our eyes open for paths on our left. The trail to Arch Rock was closed for repair so our first opportunity to venture inland was just past the three mile point. South Shore Road sounded right, so we took it, not really knowing where we were going, but confident we couldn’t get too lost on so small an island. The trail took us uphill and past the airport and a golf course. I have to admit, however, that we were a bit dismayed when, after running inland for a good 30 minutes or so, we came back down to the shore and found that we were only at the five mile mark. Still three miles to go and only a half an hour before the B&B stopped serving breakfast! I was already running as fast as I was comfortable, so Bryn volunteered to speed off ahead and procure us our meal. No gentle cool down that morning, but fortunately for the other guests there were seats available out on the porch. Bryn and I visited a couple of galleries, “channeling” Mark by engaging the owners in spacious conversations about life on the island and art. We learned that even the horses are a summer labor force that come over from the mainland to spend the summer carting tourists. 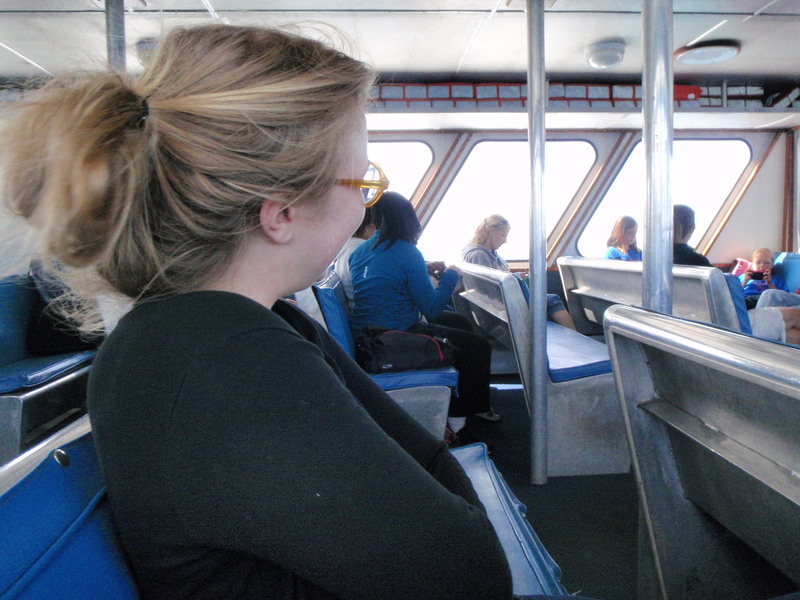 Eventually it was time to leave the island and be on our way. Mark is so present….so, so very present….smiling and slightly snorting alongside you both. So glad yo made it for breakfast! I mean, seriuously….what is a vacation exploration without THAT meal?! ?, eh? I enjoyed connecting with your time on Mackinac. Roger and I are in our “Michigan Years” as you know with Kaylea at school in Grand Rapids. On our last visit we stayed next door to your B and B so I have lovely mental pictures to add to the pics that you posted. Also, the joy of the time together in the car sharing with a daughter- like they say in the Visa commercials….priceless. I love your writing style, I feel as though I’m there with you.